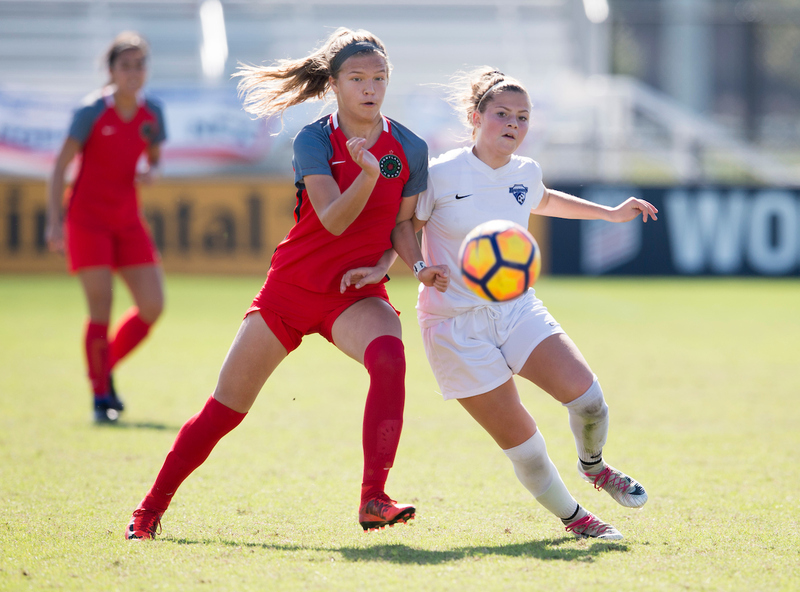 The launch of the U.S. Soccer Girls Development Academy this September marked a crucial step in the acceleration of the development of young female soccer players across the United States by establishing a pathway for the highest level of elite girls' soccer in the country. Out of the 69 clubs chosen to be part of the first season of the Academy, several have a direct tie-in with the National Women's Soccer League, which provides these young girls a chance to have firsthand experience and train alongside professional soccer players, which includes several U.S. Women's National Team members as well as other international players. These clubs are: Boston Breakers, Houston Dash, Orlando Pride, NC Courage, Portland Thorns, Seattle Reign, Sky Blue FC and the Washington Spirit (Virginia and Maryland). While the Boys' Academy has long served as a pathway between youth club and the professional level, the Girls' Academy is in the early stages of guiding players up the pathway in similar fashion, with girls having the opportunity to play for their home teams and in front of their home crowds if they are able to craft a career in professional soccer. "Everything starts with developing players so if we have a clear path that can start in the Academy, and the players know that if they work their way up they could end up being a professional, that's terrific," said U-16/17 Boston Breakers head coach Rolando Lopes. "It's a pyramid and this is an important stage of that pyramid." "For girls, it's a bit of a different route, as college does come into play, which it should, but if we can produce players, have them go to college, train with us during the summers and then come back home and be part of the Thorns, that's an enormous advantage for these girls," said U-18/19 Portland Thorns head coach Kyle Steinbaugh. Set to enter its sixth year of existence in 2018, the NWSL has become the most competitive league for women's professional soccer in the world where players from all over the world have come to test themselves against the top talent in the game. For the 2017 NWSL champion Portland Thorns, the connection between a top league and a chance to develop the future generation in their Academy has built a bridge, making all the players feel like they're part of the team, no matter the age of the player. "In a place like Portland, we have a lot going on and a lot of momentum. We have the benefit of the facilities, the benefit of the organization - obviously, the Thorns and the Timbers, are incredible organizations - and we have the support of the Riveters," Steinbaugh said. "Our girls also have opportunities to train with Christine Sinclair, Tobin Heath - who is also an Assistant Youth Technical Director in the Thorns Academy - and Lindsey Horan, etc. There's just a terrific connection between our full NWSL side and our Academy." "The launch of the DA has been a great step towards a pathway leading to the top of women's soccer. Like for us, it means that top players in our area will start coming to our Academy, and if we have the best players in our area, hopefully one day if they work hard, they can also play for Boston," Lopes said. "That's a possibility we now have, to flow top talent to the pro team." Additionally, the NWSL Academies offer their girls a unique prospect of imagining themselves on the field, on the biggest of stages. "We attended some Breakers games this year and to see those pro players [like Rose Lavelle] wearing the same color jersey and the same number that our girls wear is very positive," Lopes said. "Watching their role models motivates and helps them understand that if they work hard and keep going, they could also be there one day."